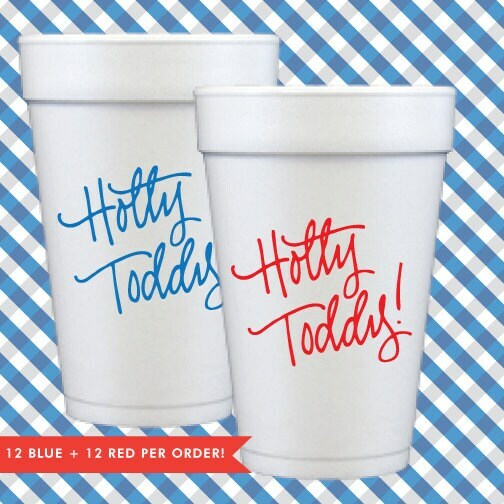 Styrofoam Cup perfect for tailgating, cheering, entertaining ... Or just because - keeps beverages hot or cold! White Styrofoam Cup | 16 oz. Hand-lettered "Hotty Toddy!" printed on the cup! You'll receive … 12 printed in Red + 12 printed in Blue. Yes! We can absolute create something custom especially for your party! Quantities start at 50. (Hint: 100 usually just a few dollars more than 50!) We happily will send you a quote for any specific quantity. There is a $35 printing plate fee. A proof will be sent after order is confirmed and paid. Please order 4-6 weeks in advance. *See hand-lettering question in our FAQ for more details. No printing plate fee! See our "CUSTOM Cups + Napkins" tab to choose your font and colors. Please order 2-4 weeks in advance. * The lettering on our cups is Natalie's handwriting and requires custom art and printing plates. Will Natalie hand-letter custom art for me? Absolutely! She will gladly custom hand-letter to be printed on our products! A $35 custom printing plate fee will be applied to your order. Your printing plate is a one-time fee will be kept on file - you can use it on as many products as you wish and and there is no charge to use it on any additional products for any future reorders! *At this time, hand-letter files are only available for printing on our products. Is a "RUSH" option avaiable? All of our instock items ship within 2 business days - and via Priority Mail (guaranteed 3-day delivery) from Harrisburg, Illinois. For custom orders, please allow 2-4 weeks for delivery for Custom Orders with standard font, or after a hand-letterer custom order proof is approved. If you need something SUPER FAST - send us a "convo" with your event date what you are looking for ... chances are we can make it happen! We will let you know an exact timeline of what we can do and if any fees will apply. Do you have Christmas Cards? Christmas Photo Cards, Non-Photo Cards, Invitations, Return Address Stickers, Gift Tags and Stickers are all available! You can upload your picture, type your names, choose return address stickers ... and proof it online! Orders will be shipped straight to your door! Visit any local stationery store and ask to see their PicMe! Album by Printswell! *note: at this time we are not doing Custom Christmas Cards. Absolutely! No charge for us to add a big bow and hand-written note ... just leave a note in the notes section and we'll take care of everything. Sent this as a gift… Recipient loved it! She commented on how beautifully the gift was presented and wrapped! Thank you! These Styrofoam cups are awesome!